A horrific start to Holy Week as Notre-Dame Cathedral in Paris is ablaze. 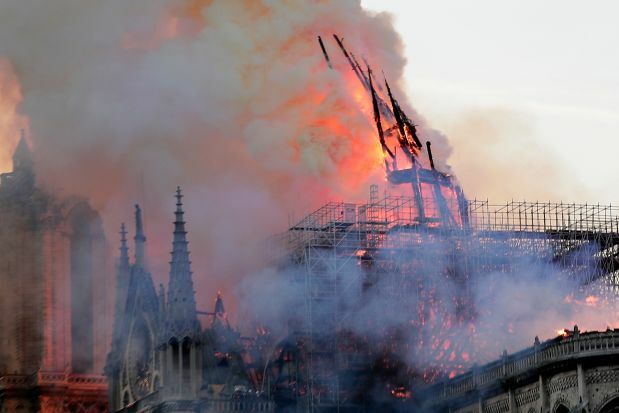 The 856-year-old cathedral’s spire has collapsed and a spokesperson says the entire wooden interior was in flames. ”Everything is burning, nothing will remain from the frame,” said the spokesperson. The cause is unknown but is believed to be possibly linked to renovation work. There are numerous posts and pictures on social media, with one person saying he’s lived in Paris for years and always felt a little ”touristy” every time he stopped to take a picture of Notre-Dame, but now is grateful for every one. Sixteen religious statues were removed last Thursday from the peak for the first time in over a century to be taken for cleaning.